Booster Page automates and simplifies the distribution of Amazon and Shopify one-time use coupons. The Booster Page functionality is a two-page process consisting of a coupon opt-in page which is followed by a coupon delivery / thank you page. After a visitor opts-in, their email address and unique discount code is also sent to your connected CRM mailing system so you can setup a campaign / flow / automation there as well. Your coupon codes can be created and downloaded from your Amazon Seller account or from your Shopify Discounts section respectively. After creating the codes, save them into a CSV file and then upload them. Every new code should have its own row. After selecting a file, a list with a default title will be created and all of the coupons from the file will be imported. You can click on the list to see the coupons. 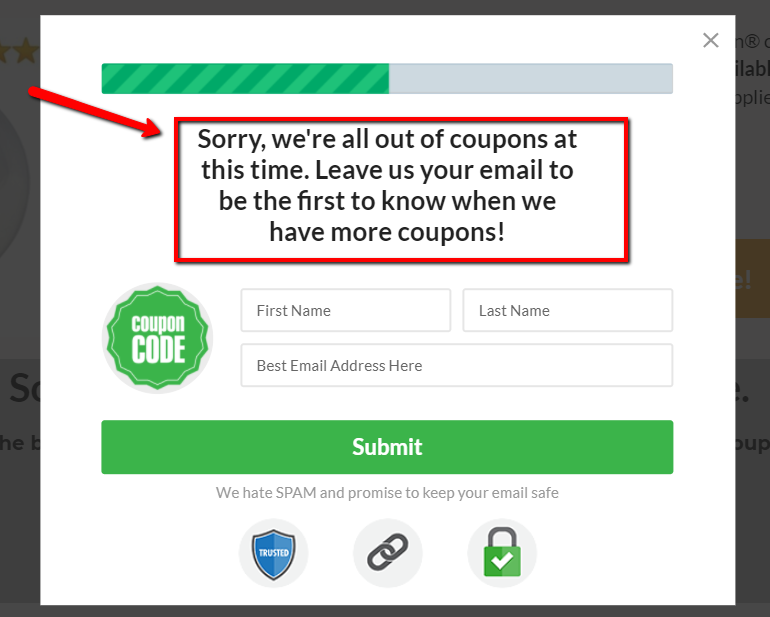 Each coupon has a (used and issued) status and a sent to emails column. You can change the coupon’s list title at the top of the table. Note: You can only add unique coupons to the list. Duplicated coupons won’t be imported. Adding an existing coupon to a created list will be rejected. The CSV file should be a single column of unique one-time-use codes. 3. 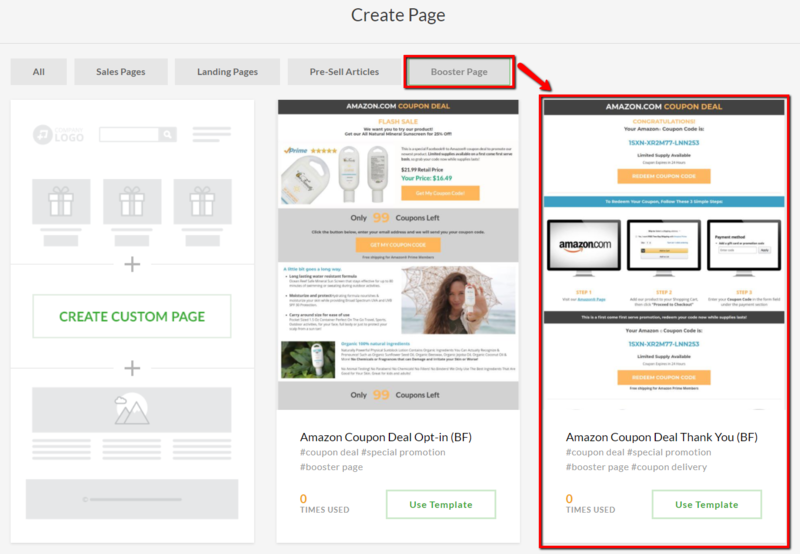 Create a "Coupon Opt-in Page" template in the Create Page > Booster Page section. This template also has a Booster Page Opt-in that on a published page will show an amount of unused discounts. 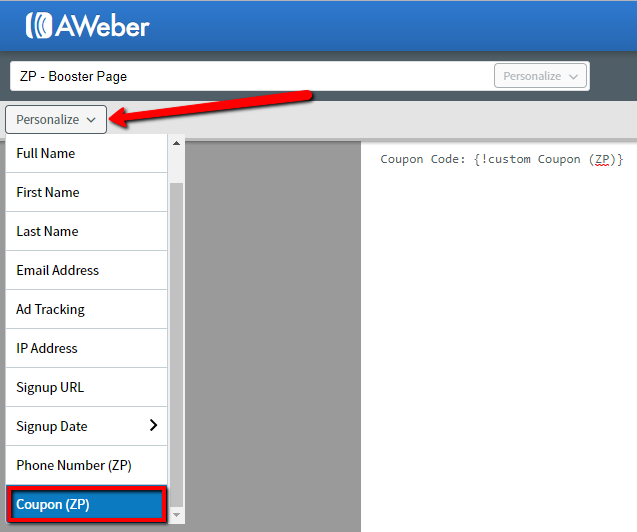 Running out of coupons state is also available for the Booster Page Opt-in. 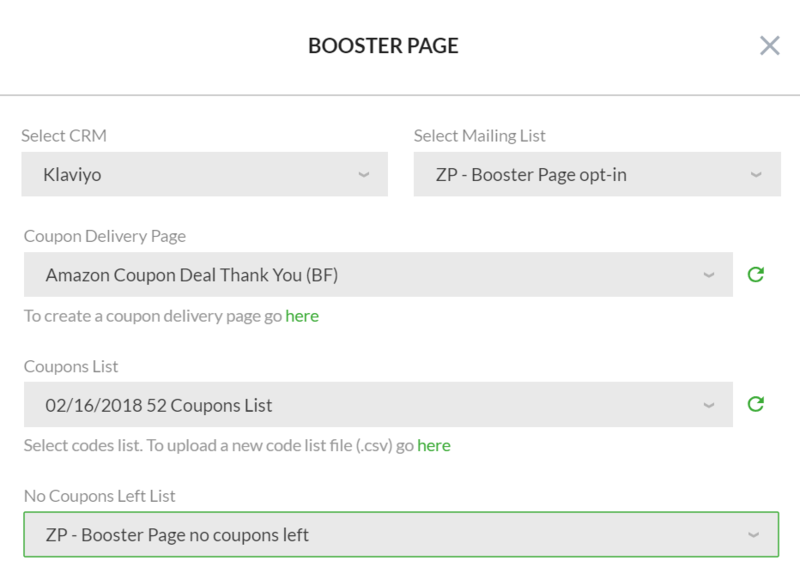 Booster Page Opt-in and Coupon Delivery blocks are both unavailable in the "Add block" section. You can add them via the "Add existing block" feature. 1. Select your supported CRM from the "Select CRM" dropdown. If you haven't connected one yet, go to Settings > Integrations to connect a CRM first. 2. Select the mailing list from your CRM that you want to gather your opt-ins on from the "Select Mailing List" dropdown. Note: The opt-ins will be sent there along with their unique coupon code. The coupon code is sent as a custom field called "Coupon (ZP)" that can be used in the construction of an email's content. This custom field will be available within your CRM after you optin through the lightbox popup form so we recommend to run a live test to have this variable passed over. 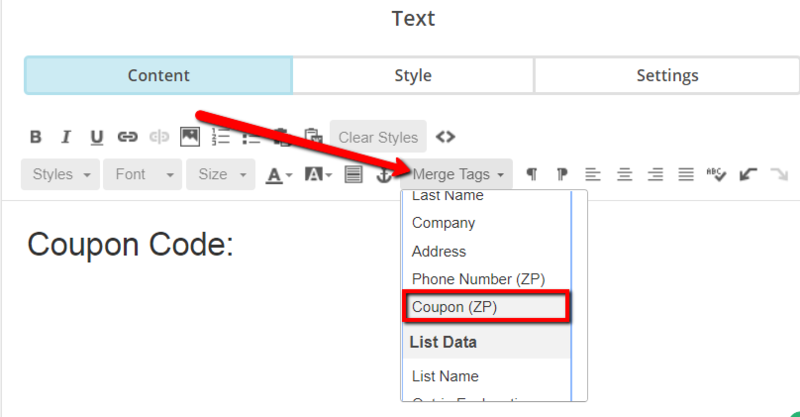 Use it to setup a flow/automation/campaign in your CRM that sends them an email with their coupon code dynamically included. 3. Select the "Coupon Delivery Page" that you created and published earlier from the dropdown. If you haven't created one yet, click the "here" link below the dropdown to create one. 4. Select your uploaded "Coupons List" from the dropdown. If you haven't uploaded one yet, click the "here" link below the dropdown to upload one. 5. Select the "No Coupons Left List" from your CRM from the dropdown. This is the list that visitors will opt-in to when there are no coupons left in your coupons list. 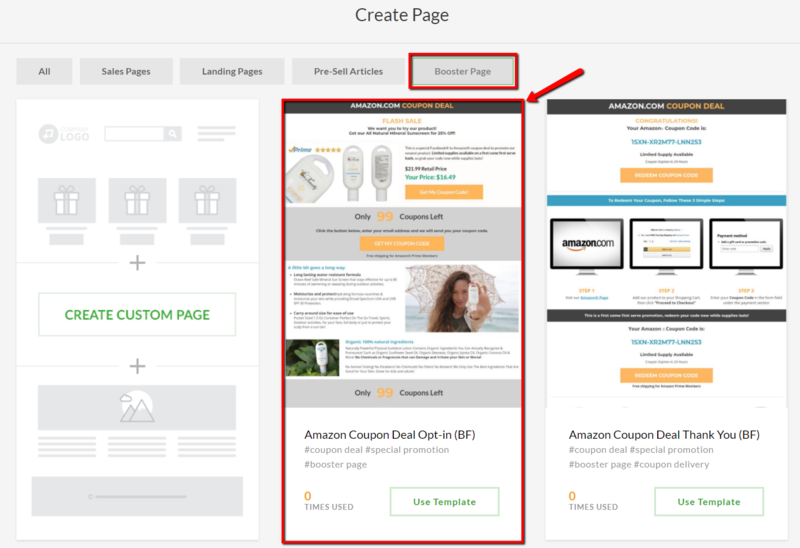 Here is where you configure the appearance / options for the light-box popup that is presented to the page visitor after they click any of the buttons on your "Coupon Opt-in Page". As an option you can choose a list where the emails will be imported in case there are no coupons left. No Coupons Left Success Message: Here is where you configure the text to display after a visitor successfully opts-in to your "No Coupons Left" list. 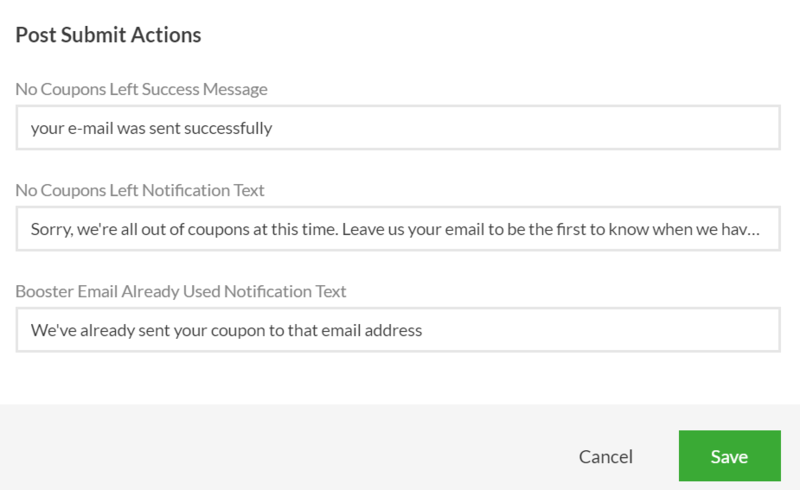 No Coupons Left Notification Text: Shown on the opt-in popup if there are no coupon codes remaining on your list. Configure the text to be shown there using this field. After submitting a popup, the email will be passed to the CRM and they will receive a success alert. The default messages texts can be changed in a Booster Page edit pop-up. Booster page functionality is only available for Zipify Pages Plus subscription plans. With a Basic plan a user will see special stubs instead of controls. Booster Email Already Used Notification Text: If an email was already used to opt-in, Booster Page will not allow a submit so that the same email can't receive a coupon code twice. Configure the text you want displayed to the visitor in this situation here. 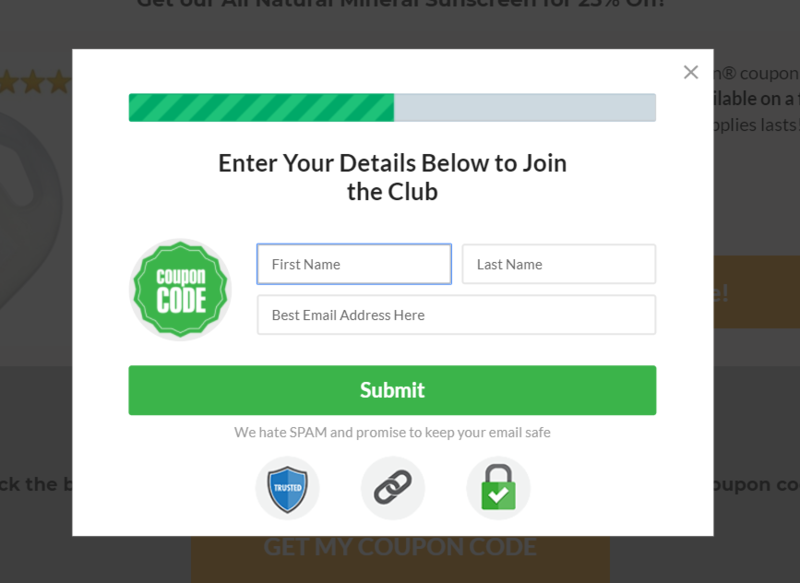 After a visitor successfully opt-in, they will redirected to the "Coupon Delivery Page" and their email address and coupon code will be sent to your connected CRM. 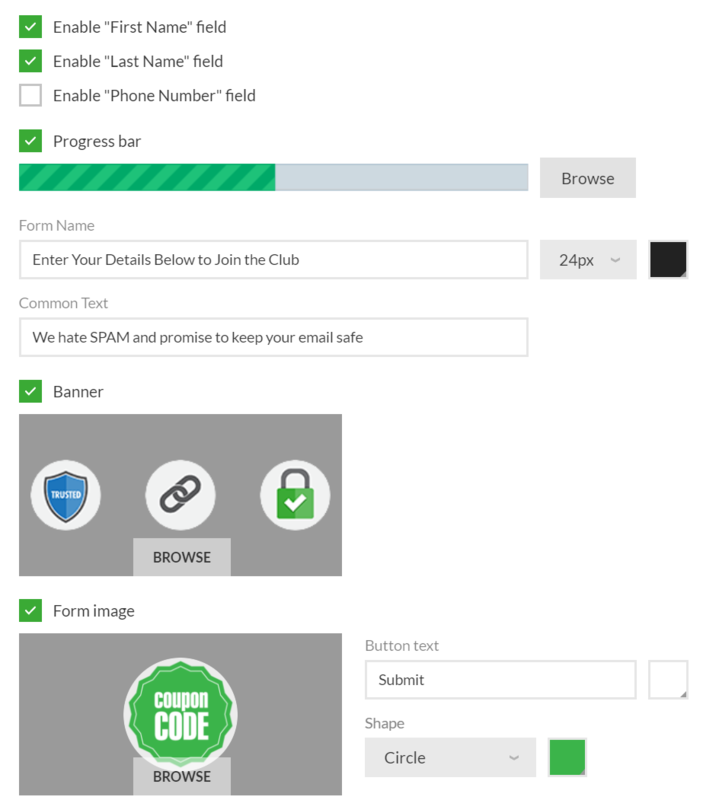 You can setup a campaign / flow / automation and use the coupon code variable within the body of the email that you send out anywhere that you want it dynamically displayed.